Green People has launched the first certified organic fluoride toothpaste specially formulated for children. This industry-first is certified organic by the Non Food Certification Company with more than 84% certified organic agricultural ingredients. Multi-award winning, Organic Children toothpastes are one of the leading natural alternatives to mainstream brands. These top-selling lines are made without SLS, a foaming agent which can affect the delicate mucous membranes lining the mouth and may lead to irritation, ulcers and bleeding of the gums. Active ingredients include gum-soothing aloe vera, anti- inflammatory myrrh and antibacterial olive leaf. These natural plant actives help to control the growth of dental plaque, effectively cleaning the teeth and supporting healthy gums. 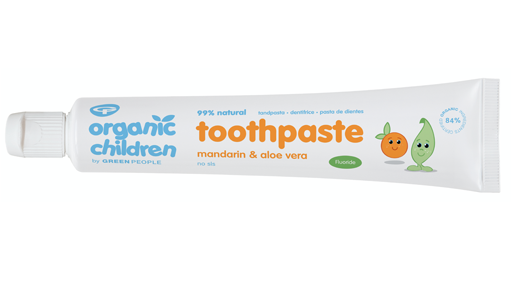 The fluoride-free options also available from Organic Children include Mandarin & Aloe Vera Toothpaste and Spearmint & Aloe Vera Toothpaste, both priced at £4.25.